Take Current Affairs quiz March 23, 2019 to enhance your General Awareness. Practice with our esteemed Current Affairs quiz March 23, 2019 questions which covers all important events across India as well as World. Make use of all important Current Affairs quiz March 23, 2019 questions with answers updated here, at free of cost to succeed in all competitive Exams and Interviews. RBI declined which Bank's proposal to name change after its merger with LIC? The Reserve Bank of India (RBI) has turned down IDBI Bank’s proposal to change its name following the transfer of a controlling 51% stake to LIC, insurance behemoth, from the government of India. Due to the squalid conditions in the Gaza Strip 40 animal were moved to the sanctuaries of ________. Forty animals, including five lions, are to be rescued from squalid conditions in the Gaza Strip, Palestinian. The animals would be taken out of a zoo in the Palestinian enclave and relocated to sanctuaries in Jordan next week. Which of the following spacecraft has its mission of the asteroid Ryugu? Japanese space agency, JAXA's Hayabusa2 spacecraft has its mission of the asteroid Ryugu. Social media platforms and _________ presented a 'Voluntary Code of Ethics' for the General Election 2019. Social media platforms and the Internet and Mobile Association of India (IAMAI) presented a 'Voluntary Code of Ethics' for the General Election 2019 to the Election Commission of India. India Post released a special stamp cover on Ice Stupa in ________. India Post released a special stamp cover on Ice Stupa in Leh at an event in the presence of Himalayan Institute of Alternatives Ladakh founder Sonam Wangchuk who spearheaded the Ice Stupa initiative. What is the position occupied by Indian shuttler PV Sindhu in the latest World Badminton Rankings? In the women's singles rankings, P V Sindhu and Saina Nehwal are static with Sindhu at sixth and Saina at ninth position. Japan's Kento Momota is leading the men's chart while Chinese Taipei's Tai Tzu Ying is topping the women's singles list. Who is the recipient of the 2019 Templeton Prize? Power Finance Corporation (PFC) will acquire the entire 52.63 per cent shares of the government in REC for Rs __________. State-owned Power Finance Corporation (PFC) will acquire the entire 52.63 per cent shares of the government in REC for Rs 14,500 crore by the month-end, a move that will help the centre to meet its disinvestment target. Recently, Ministry of Defence has cleared the proposal to procure _______ lakh hand grenades for the Indian Army under its Make in India programme. Ministry of Defence (MoD) has cleared the proposal to procure 10 lakh hand grenades for the Indian Army under its Make in India programme. The Rs 500 crore proposal comes shortly after the Defence Ministry cleared the acquisition of assault rifles and signed a joint venture with Russia to manufacture AK-203 rifles for the infantry units of the Indian Army. Which of the following Indian shuttler placed in top 10 in the latest World Badminton Rankings? Kidambi Srikanth remains static and is the best placed Indian in the men's rankings at seventh. He is followed by Sameer Verma (14th), H S Prannoy (24th), Subhankar Dey (43rd), Parupalli Kashyap (48th), Ajay Jayram (52nd) and Sourav Verma (53rd). New Zealand ban Assault Weapons. CSK to donate IPL opener proceeds to families of Pulwama attack. Ministry of Coroprate Affairs releases national guidelines on responsible business conduct. Uttarkhand state plans to introduce caravans in major spots to boost tourism. Are you looking for right place to enhance your Knowledge on Current Affairs of 23rd March 2019 through effective Quiz section? FreshersLive grants you the advantageous Current Affairs Quiz questions with accurate answers for 23rd March 2019 which covers all the important events, supreme Awards, major occurrences in the National as well as World level. All important Current Affairs Quiz questions of 23rd March 2019 are updated instantly in this page. Everyday at least 25+ Current Affairs Quiz Questions are displayed in this FreshersLive page. Correct Answer for each quiz question is given at the end of the entire 23rd March 2019 Current Affairs Quiz questions section. You can estimate and upgrade your GK by attending these useful quiz questions. 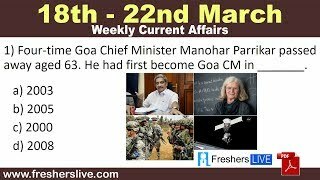 Entire quiz questions of 23rd March 2019 Current Affairs covers Competitive Exam as well as Interview point of essentially important topics like International News, National News (ie. Indian Affairs), Science & Technology News, Environmental News, Bills & Acts Passed by Government, Defence News, About important Persons, Places, Banking & Economical News, Awards & Honours, Sports News, Revolutionary Updates on Arts & Culture, Obituary, Summits & Conference, Important Committee, Schemes, Appointments, Important Days & its Theme for Current as well as upcoming Year, Books & Its Authors, Agreements & MoUs, Budget, Taxes, Various Important Lists & Indexes, Visits by World Presidents, Prime Ministers, Political affairs and all Current Events. 23rd March 2019 Current Affairs Quiz Questions updated in this page are prepared in the sense to help all aspirants to succeed in various Competitive Exams like UPSC IAS and other Civil Services Examination, Various Bank exams like IBPS PO, IBPS Clerk, SBI PO, SBI Clerk, RRB PO, RRB Assistant, Insurance exams like LIC AAO, UIIC Assistant, Railway Exams, Various Central Government Exams like SSC CGL, SSC CHSL, and more. Attempt all the Current Affairs Quiz Questions of 23rd March 2019 and evaluate your score by matching your response with the correct answers mentioned at the end of this quiz questions section. By practising the FreshersLive Current Affairs Quiz Questions on a daily basis, you can surely succeed in the competitive exams as well as the interviews easily. Make use of this ultimate resource to the fullest and quickly achieve your goal!